Hobby over Skok as well today. 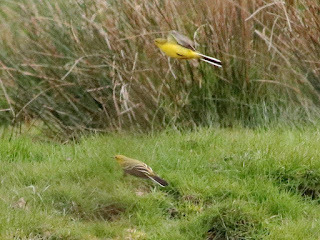 Also two Yellow Wags and a Tree Pipit. Vocal Tree Sparrow still present today, a Red Kite over and 24 Whimbrel feeding in sheep grazed fields at the north end early afternoon. A Hobby soaring over the south side of the Deer Park at about 1300, being mobbed by the resident Choughs. It drifted away towards the North. Singing at the Gann this morning, little else the four Bartails still present & 14 Whimbrel over. Nice to meet Owen & Glynis Roberts of Pembrokeshire Birding Hall of Fame as well. 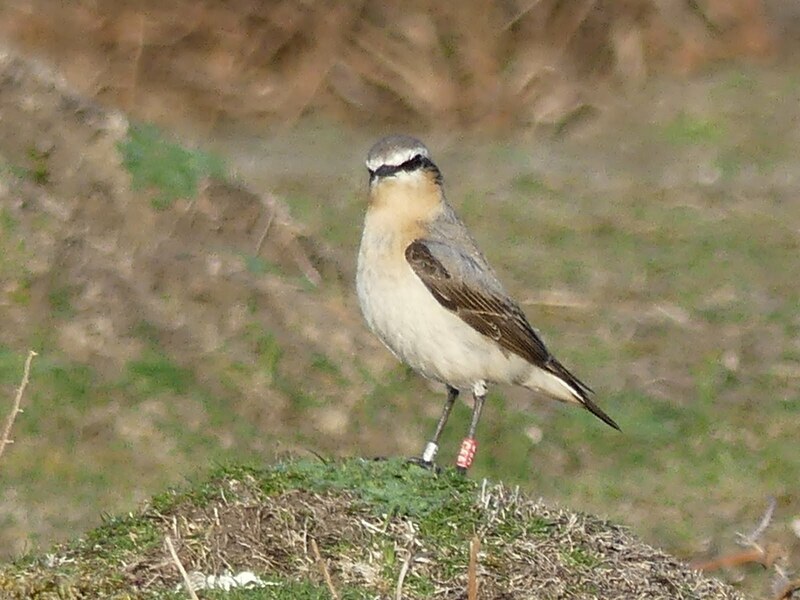 One on Ramsey briefly this morning, the first since 2003 when a pair bred. 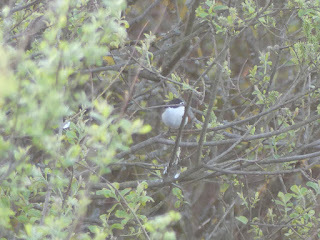 Lots of Blackcaps around first thing but most soon disappeared, also another Lesser Redpoll over and 2 White Wagtails. It was an almost perfect morning for a first BBS visit to the Pickle Wood 1 km sq. this spring and to look at other nearby woodland. 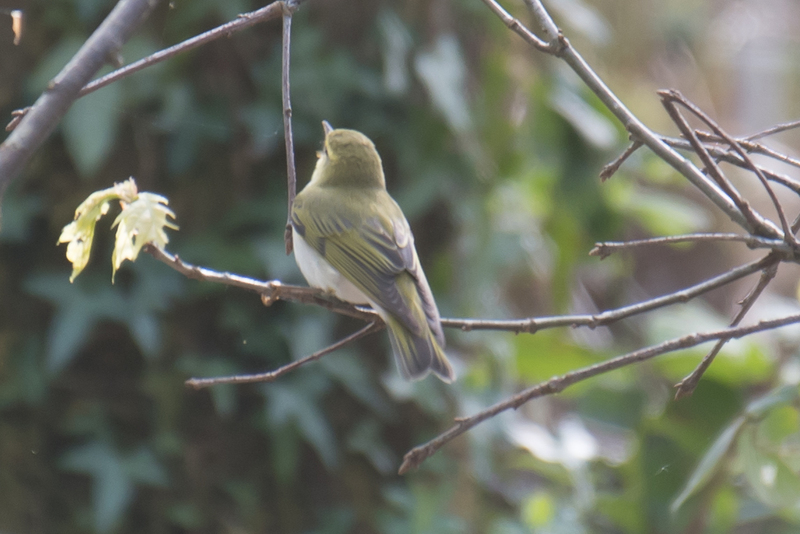 Wood Warblers are back at some expected territories, a few males were trilling away and visiting the ground at some likely nest-sites. Hopefully by next weekend most of their usual territories will be occupied. Tree Pipits were singing well in one clearing and a garden warbler was singing in nearby scrub. The total number of willow warblers recorded along the transect route was the highest here for a few years which was nice to see and hear. 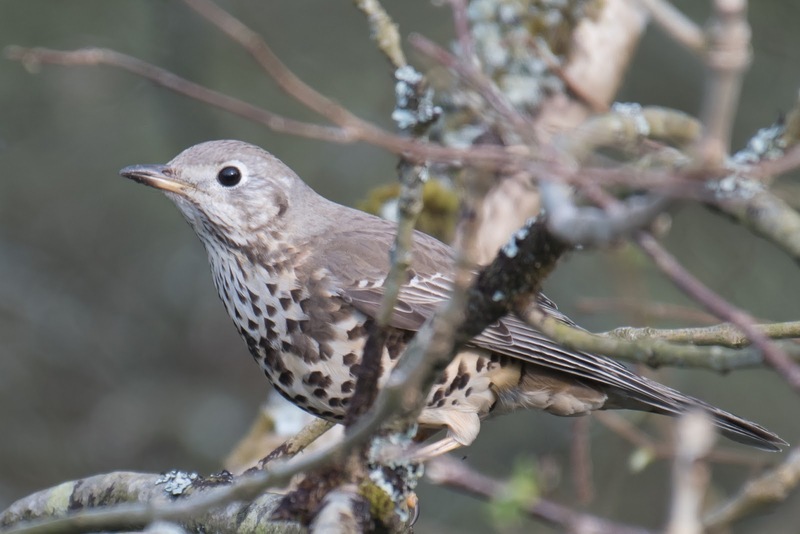 Mistle Thrushes too seem to be doing well in the area this spring - several singing males were noted and at least two pairs were feeding young. Siskins were collecting nest-material near the picnic site - this being quite a good spot to see them well first thing in the morning. Judging by the song, there seemed to be a reasonable number of reed warblers over in the Slebech reed-bed. 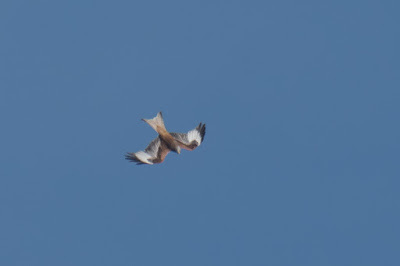 A distant high flying (presumed male) red kite was on full alert - displaying and stooping at a male sparrowhawk (which was also displaying high over the forest) and also giving the local raven and a passing heron a bit of a hard time. A nice range of woodland species anyway and a lovely sunny morning to absorb it all. Several sedge warblers singing at Abermawr today. And loads of sand martins below the path - more than I've personally seen there in recent years, I think. 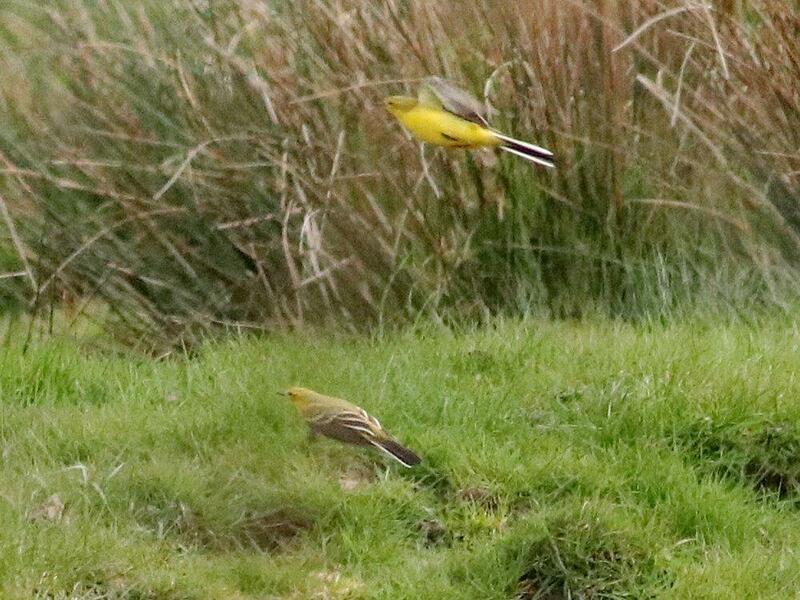 A Yellow Wagtail on Skomer this morning. Three summer plumage Black Guillemots in the harbour this morning (& yesterday). As usual best viewed from the middle breakwater looking towards the ferry terminal. 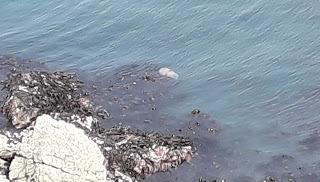 Though sometimes a bird is seen below the Fort, closer to Lower Town. Highlights from yesterday evening were a Kingfisher and Dipper, and a pair of Greylag Geese that flew over, calling, at dusk. I wonder where they are roosting? Reasonable numbers of Blackcaps calling and singing, but otherwise felt a bit empty of summer visitors: no hirundines of any sort. 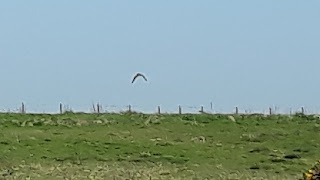 Received an email from Richard Harris on holiday in the area to say that this afternoon he had been watching 2 Short Eared Owls quartering a rough fields near Nolton Haven. He sent a digital image of one of the birds (the view of it is a bit distant) and also managed some video clips but hasn't had chance yet to upload these yet. They'll most likely be transient birds but worth looking out for perhaps over the following days. 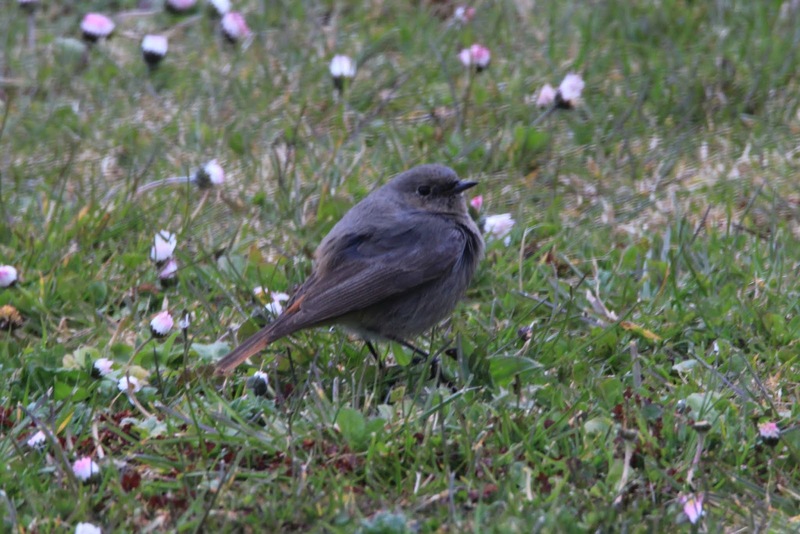 There were plenty of whitethroats on the Angle peninsula coast yesterday - some appeared to be back in their usual breeding territories. There were quite good numbers of swallows moving along the Castlemartin peninsula coast this morning (probably in excess of 4-500 in an hour between 09:00 and 10:00) plus a few dozen or so house martins. A female merlin was hunting some of the hirundines above Pen-y-holt Bay. Stunning evening to be out and if the sunset wasn't reward enough a male Pied flycatcher just out from the Britton Hide certainly made it worthwhile. 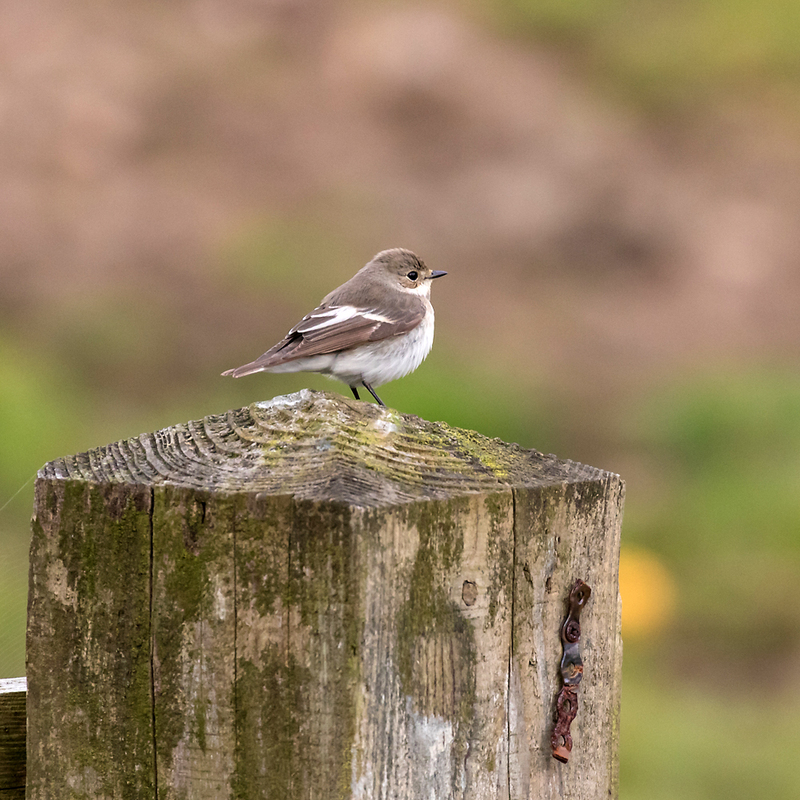 c50 Pied/ White wagtails in Trehills field by Oriole Hide and also on hedges and fences, and loads of Swallows low over the water. The Swans were away from the nest and a GBB gull was having a good look while they were distracted. Also 6 Snipe flying around. 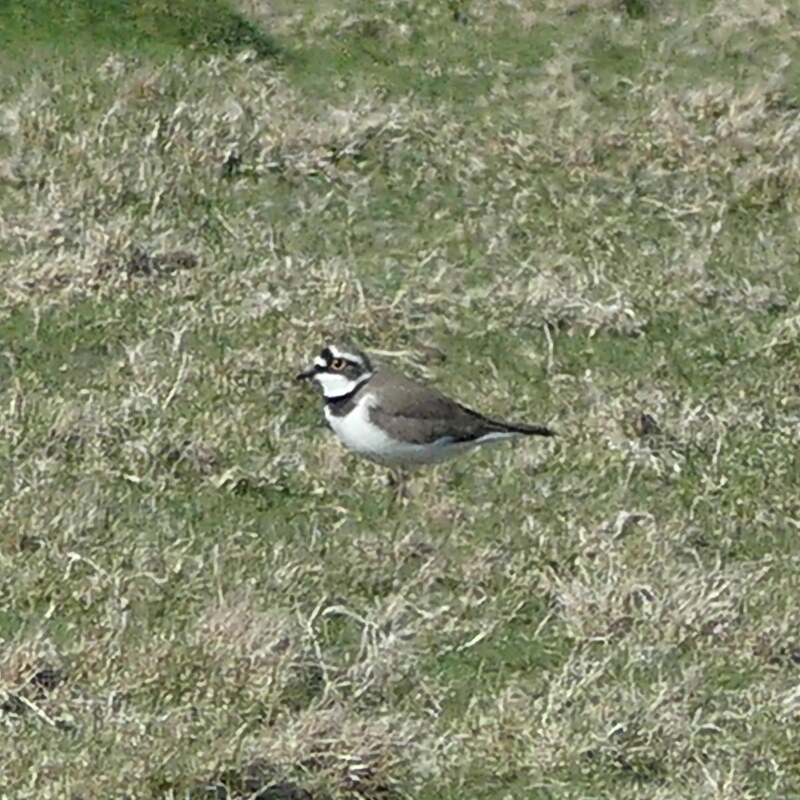 Nice to discover a Little Ringed Plover on Ramsey Island during a Breeding Bird Survey this morning, more of a surprise was that it is apparently the first for the island! 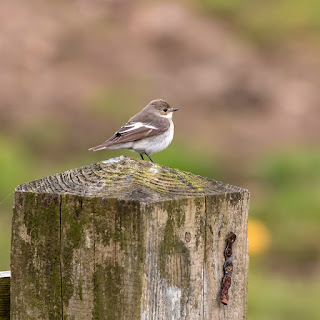 Also a Red Kite, a Lesser Redpoll and a colour ringed Wheatear which took 2 attempts to read but read it we did thanks to the trusty Lumix FZ330....C6A. Look forward to hearing more about it. 2 Common Sandpipers being the latest arrivals, 5 Whimbrel on the shoreline with c 12 over calling heading North. About a dozen RP / Dunlin flock flying around with 1 GN Diver in the bay first thing this morning. Offshore today on a very quiet sea. Puffins seem to be on eggs already and similarly the first Razorbill and Guillemots have laid - its going to be a record early season for the seabirds. The Puffins could be gone by early July if they are incubating en masse byt mid April. 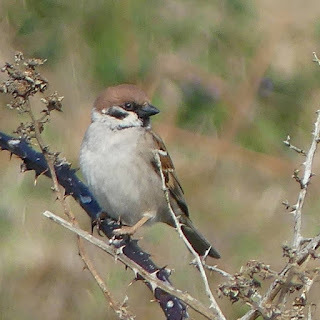 Lots more migrants around with Whitethroats and Blackcaps along the hedges but there still seem to be few hirundines around. 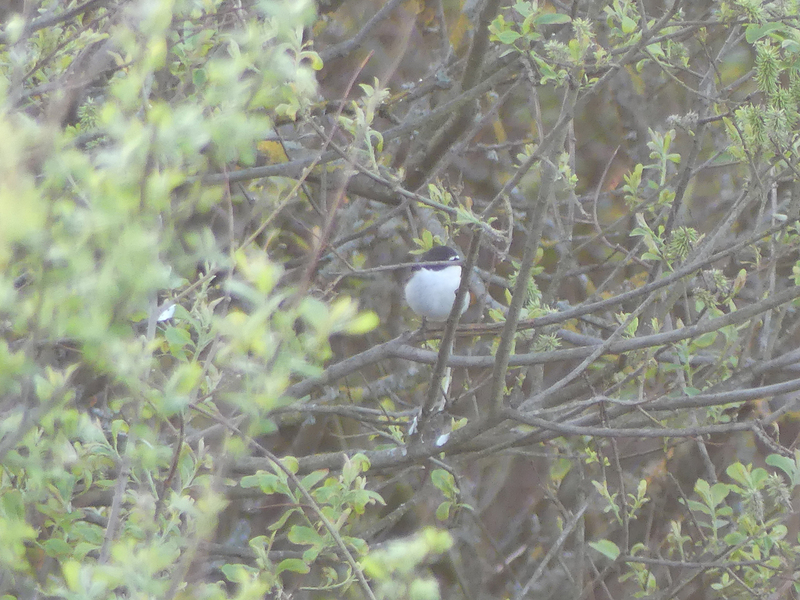 We went for a walk past Marloes Mere then along the cliff tops this morning in order to find some Whitethroats. We succeeded - there were plenty singing though I think the full complement had not quite arrived yet. One was even carrying nest material - a very fast worker! Other fast workers were a pair of Stonechats - they were feeding young with big caterpillars so their young must have been well grown. A few Sedge Warblers were singing loudly at the Mere and there were plenty of skylarks between the Marloes iron age fort and Martins Haven. (However, this area had about 10 crows on patrol - marching around on the ground looking for things to eat I presume - I fear for the lark and pipit nests.) Linnets were everywhere, in pairs and in small groups, and singing. But the best thing about the walk (off-topic alert) were the flowers - thrift, kidney vetch and spring squill all blooming together. And the carpets of spring squill on the rocky banks above the little stream that tumbles over the edge at Marloes fort were spectacular. Garden Warbler was new for the year on the reserve, with Lesser Whitethroats singing on the reserve and in Poppit Dunes. Gary Reynolds picked up a Cuckoo calling three times whilst watching waders from the Webley. Two each of Whimbrel, Ringed Plover and Dunlin present on this morning's high tide. A female Goosander still present on the river and a Common Sandpiper from the river view point too. 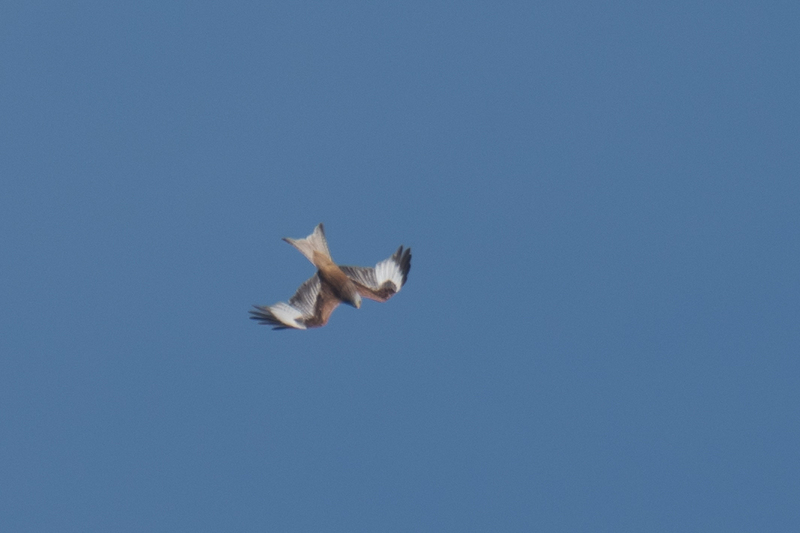 First Whitethroat and Lesser Whitethroat heard singing this morning, near the toilets and in the Burrows, also an over flying Red Kite and Whimbrel foot prints on the very narrow beach. High spring tide first thing this morning - no sign of Alan's osprey but loads of whimbrel - 25 on the West Williamston shore, more heard on the opposite shore and in the Cresswell River. 5 greylags flying about, more heard. Lesser Whitethroat in Poppit Dunes was the our first on the Teifi this year. Grasshopper Warblers still reel from the marsh amongst the Sedge and Reed Warblers and 81 Black-headed Gulls on the river opposite Curlew hide seemed a good mid- April count. A slow increase in the small waders - 20 Ringed Plover and 15 Dunlin around the estuary this evening. I had a great view of an Osprey yesterday at 11.45 am.It was carrying a fish and circling above the Cresswell river near Lawrenny, before drifting off in the direction of Carew. Corse early - lots of sedge warblers singing, one grasshopper warbler reeling. West Will later - 6 whimbrel. Firstly well done Wildlife Trust for repairing the boardwalk and habitat management, scrub clearance etc. It would be nice if NWR could do the same on their reserve! It was one of those Spring Mornings when it was good to be alive and all the birds were singing! Not all were showing particularly well and a gropper (Grasshopper Warbler) was skulking and throwing its voice making it hard to locate. I eventually got a couple of record shots. Willow warblers seemed to be everywhere at least half a dozen singing but again not a particularly brilliant shot.. A pair of Reed Buntings were much more accommodating but Sedge Warbler and Whitethroat only showed odd glimpses and a pair of Blackcap's were hiding deep inside some blackthorn blossoms! Blackcap, particularly female and Whitethroat most evident on usual circuit. Dozen White wagtails and same of Wheatear in West Hooks fields. Tree pipit calling over the Deer Park, also 2 Grasshopper warblers. 2 Whimbrel flying over Marloes Mere, others calling out of sight. Male Kestrel. Good to see Sash and thanks for the little tour, you didn't miss anything. Five in the bay at the Gann this morning. I had never seen a “fall” of Blackcaps before today, but it was a wonderful experience. 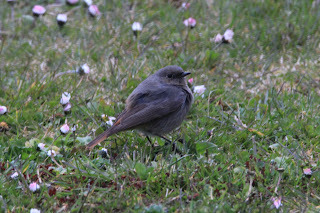 Most of the morning, the bushes in the valley were full of the birds: a pretty even mix of males and females. In total probably 40, and maybe 50: hard to be precise, but I frequently had five birds in the field of vision of my binoculars. Of interest, they were remarkably silent: no sub-song or even contact calls. Instead they fed steadily, generally by “hawking”, and flying up from the top of willows and sallow to catch flies, before diving back down. Also coming through the valley were good numbers of Whitethroats: 3 males singing, as well as Willow Warblers and Chiffchaffs. A single Sedge Warbler started singing: terribly welcome, since they have not obviously bred here in recent years. This evening at Marloes Mere, 15+ pairs of Teal, a Shelduck and the Pintail. 7 Black-tailed Godwits flew in and around, but I could not see them land to roost. Stunning views of the Hoopoe at West Lambston this evening, which came within 20 feet of us as we sat in the car. Many thanks to Joy Squires for allowing us to view it. The bird flew off before we left, having attracted the attention of the farmyard cat, but it may not have gone far. At West Lambston, just had a phone call from Joy Spires (owner of west Lambston) that the bird has been present most of the day. She is happy to have a birder or three visit if anyone wants to pop over. Brilliant summer birding along this particular stretch of coast today. 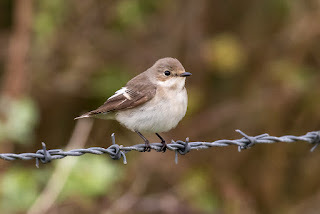 Highlights were fulmar, gannets, rafts of razorbills and guillemots, spotted fly, wheatear, willows and chiffchaffs and good numbers of whitethroat too. The warmth also brought out some beautiful butterflies such as orange tips and common blues and some WHOPPING jellies. Careful if you are a sea swimmer! There was also a male but was unable to get a shot of it. Several Blackcaps, Chiffchaff and Willow Warbler in the gorse alongside the Lodge, plus a Whitethroat displaying. Swallows, Whitethroats, Chiffchaffs all back on the Refinery site, also an Osprey heading towards Pembroke River 1430. 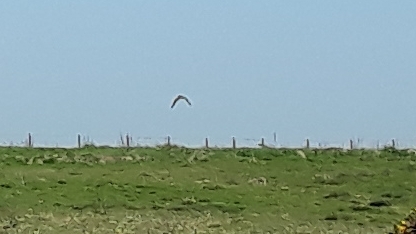 Ringtail hen harrier hunting over Kilpaison Burrows - probably the one that's been here all winter. Minimum of 5 Cetti's along the length of the Corse. Several swallows, willow warblers singing in the old decoy ponds area but sedge warblers heard a couple of days ago not singing. Yesterday evening - 5 x whimbrels in the ploughed field NW of the iron bridge. 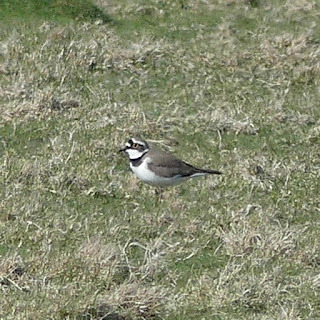 And 14 x ringed plover (no sign of Cliff & Fran's special one), 14 x dunlin. A little gathering of linnets, meadown pipits, stone chats and a female reed bunting around the Bennet pond. 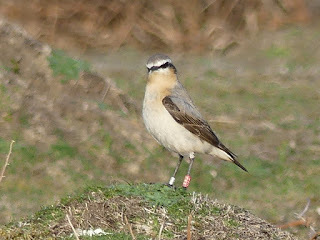 One at East Hook Farm last Saturday to Monday (Alastair Mylechreest). From Mark Cherry : 2 whimbrel, accompanied by 3 Bar-tailed godwits. 3 pairs of shelduck but no courtship calls heard. Teal pair near the houses. 4 linnet, headed for the haven. 60 Oyc’s. Blackcap, chiffchaff, dunnock song. 3 Magpie which I rarely get to record here. Unusually tolerant heron. 1 GBBG and its juvenile. Cresting the ridge disturbed a rock pipit and - a personal first for this location - a wheatear. Male Ring Ouzel on the slopes of Carn Ysgubor this afternoon, first Common Whitethroat of the year and plenty of Blackcaps today. 3 Black-tailed godwits, a few Sedge warblers tonight. Duckwise: 42 Teal, 6pr plus 3m Shoveler with 6m and 2f courting, pr Wigeon, pr Shelduck, drake Tuftie spending more time in the south irrigation channel. Blackcaps in numbers inc first females. We didn't see the drake Garganey late morning or early afternoon, but there was a Whitethroat singing, which was my first of the year, and at least 4 Black-tailed Godwits as well as the long staying drake Pintail. A male Garganey was with a group of Teal at Marloes Mere this morning. There were also plenty of Swallows and some House Martins, and a Grasshopper Warbler could be heard reeling from a marshy area at the right of the Britton hide.